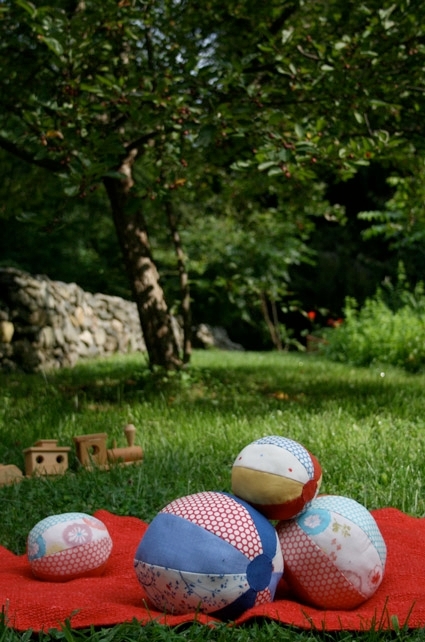 These fabric balls are the perfect handmade baby gift, multicolored, soft and round…..what’s not to love! Sewers of all levels will have fun making these toys that will be worthy of passing down from generation to generation. 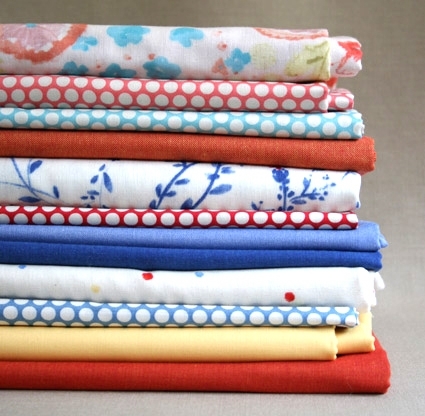 We recommend 1/4 yard of each fabric to leave room for error. Download this template for the small and medium balls, and this template for the large ball. 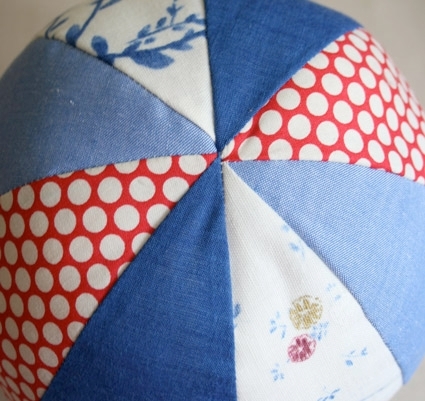 You will need to cut eight fabric pieces total to make each ball. We used two each of four different fabrics for ours. 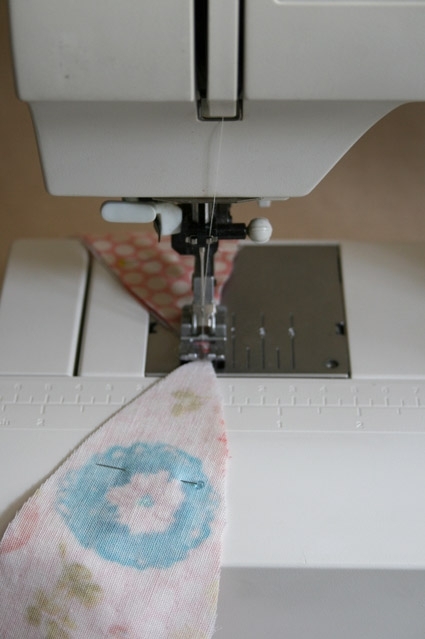 Fold fabric in half by lining up the selvages so that you can cut two pieces at a time. Lay template on the fabric and trace with a pencil. Cut the fabric on the drawn line. Repeat this process with the remaining fabrics so you have eight pieces total. 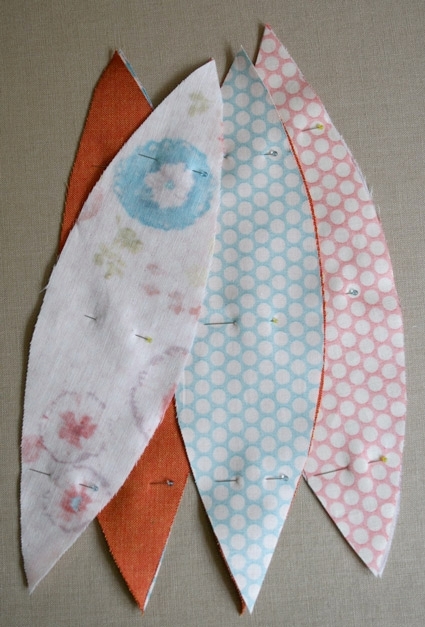 Pin the cut pieces in pairs right sides together, carefully aligning the points and edges. Chain-piece the pairs, sewing past the points at each end using a 1/4-inch seam allowance. You don’t need to backstitch because you’ll reinforce these seams when sewing the pairs together. Be sure to make smooth curves as you are sewing so that the ball will be nicely rounded. After chain-piecing, carefully cut the threads between each pair. Press the seams to the side of the darker fabric. Pair the pieces once more, aligning their cut edges with right sides together and pin them together. 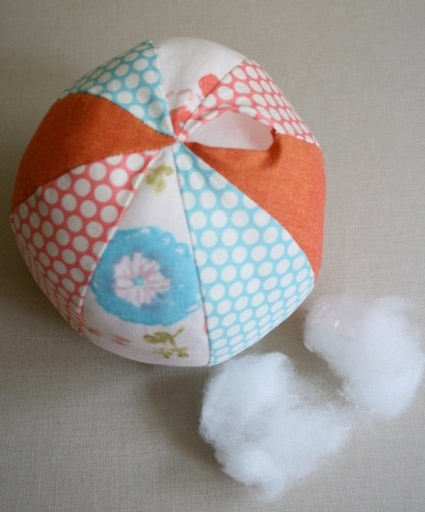 Sew them together to create two half-sphere shapes with four pieces each. Press seams to the side of the darker fabric. Turn one half-sphere right side out, and tuck it inside the other half-sphere, with right sides together. Align the points and edges, and pin the two pieces together. You’ll want to begin one of your seams 1- inch from the point to leave an opening for you to turn the ball right side out and to stuff it. Take care not to sew over the nice points you’ve made at the ends when stitching the previous seams. Your top seam should just intersect the point where the previous seams meet. Turn the ball right side out through the opening, and stuff it firmly, making a spherical ball. Fold and finger-press the edges of the opening 1/4 inch to the inside to create a clean edge. Using a blindstitch, carefully hand-sew the opening closed, stitching just inside the fold for an invisible seam. Cut two circles for each ball to sew at each end. We recommend using the darkest solid fabric for this since it is a way to cover the part where all the seams come together which isn’t always perfect. We cut a 2 -inch circle for the large ball, a 1 3/4-inch circle for the medium ball, and a 1 1/2-inch circle for the small ball. Fold and iron the edges of the circle approximately 1/8-inch. 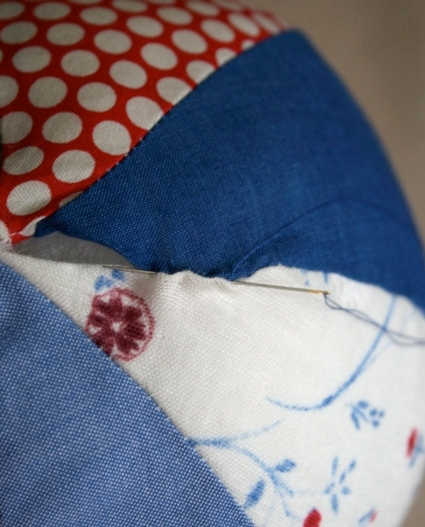 Hand-sew the circles on each end of the ball using a hand stitch. If the balls have gotten a bit misshapen while sewing on the circles, manipulate them back into a nice spherical shape and you’re good to go! I love this pattern, made them for my great nephew and I am going to make a set for my granddaughter!!! Thanks for the tutorial! I made a small ball for my son and he loves it. i love this… can't wait to make this for my 5 month old, will add some ribbon around for more fun… 🙂 thanks for sharing.. I saw these years ago, but instead of being stuffed with fiberfill, they put a balloon in it. Is anyone else balls coming out sort of oval on one end? What am I doing wrong? Try sewing the two halves then putting them together. It might help. Make sure you cut your fabric pieces with the wider part on the crosswise grain (the top of the segment should be pointing toward the selvedge). This helps prevent the fabric from stretching as you stuff. If you cut your fabric on the bias your ball will turn out nice and round. Utube has some videos if you don’t know how to do this. I've made something similar, and instead of stuffing it, I've made a button hole in the end (circle) to push a balloon inside. Once the balloon is inflated, the tied end is hidden inside. This makes a very bouncy ball, which doesn't hurt. 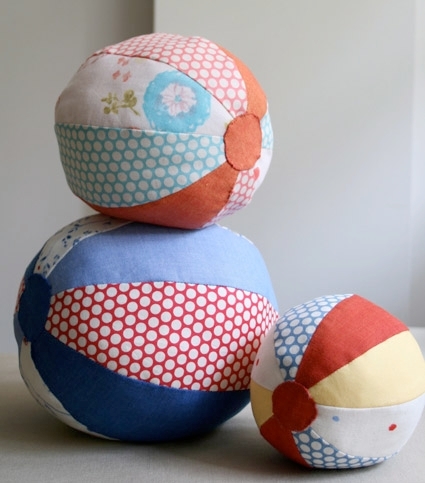 I loved the idea of fabric beach balls and decided to make one for my son, who is 17 months. Thank you for an easy and clear tutorial. I posted a review on my shop blog and am planning to make more for him. 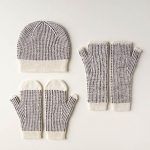 I love this pattern – even if I am so late seeing it… I am going to make several and instead of putting batting in it I am going to put scrunchies in them… making a lighter ball for little fingers. 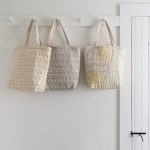 I just found this tutorial and am very anxious to make these for my grandchildren only I can’t seem to get the templates to come up. Is there something I am doing wrong or has the website been closed. Is there someway that someone could email me the templates, please? The templates seem to be loading fine on our end. Can you try from another browser? If you still can’t get them to load please email me at Molly AT purlsoho DOT com and I can send them to you directly. Please let us know if we can be of any further assistance! Going to a baby shower and now I have a ball to match my blanket and burp cloths. Thanks! Thankyou so much for the pattern and easy to follow instructions. I have so many scraps of material after years of sewing and have been looking for a project to use them up. I make quilts and toys for our birthing unit in local hospital. I have two new great grandchildren. Would love to make them one. I’m making a few of these for my nephew who is 18 months. I am using college football fabrics, but I have made these for baby shower gifts and used prints to match the other items I made. I tend to use felt or fleece for the circles on the ends of the balls, because I have trouble turning under the edges neatly. I also put a large bell in the center of each. So far the new moms and babies have loved them. I linked to your tutorial on my “Baby DIYs you can do BEFORE you find out the gender” Round up: https://aredheadmarriedageek.wordpress.com/2016/02/13/roundup-baby-diys-you-can-do-before-you-find-out-the-gender/. Let me know if this isn’t okay. I’m excited to make a ball for my Little C soon! Thanks for writing in! I am not sure what could have gone wrong. The only thing that would cause something like that might be that your seem allowance was slightly over 1/4 inch. That would account for the shape being slightly less than round. You may also try adding in an additional section to round out the balls. Mine is a rugby ball shape too! Have unpicked and will give it another go! I am sorry to hear that you are having difficulties! The only thing that would cause something like that might be that your seem allowance was slightly over 1/4 inch. That would account for the shape being slightly less than round. You may also try adding in an additional section to round out the balls. Thanks for writing in! I will pass your request on for the future! Mom used to make these. After she died I kept her house 5 years and before selling I traded washing machines. Her machine worked in my house for the better part of a year, then failed to empty. I took the pump apart and found one of the baby ball sections clogging it. What were the chances? It worked for months and months again, before it clogged. You guessed -another baby ball section! MOM, WHAT ARE YOU TRYING TO TELL ME? I think she was just saying Hi, I’m good! A grand baby coming made me think of Mom’s baby balls. Thank you for sharing, Brian! And congrats on the new addition! wow! these balls are looking so awesome and you shared amazing guide to design it. I really like and will try at home. I have now made many of these large balls for gifts. THANK YOU! For stuffing rather than the top, though. Also fun to play with just leaving balloon in without sewing the side opening, of course. Thanks for writing in! 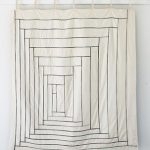 In order to insert a ball rather than stuff the finished piece, you may need to use a ball the deflates and can be placed through the small hole and inflated once inside the sewn outside. If the ball is hard, you may try leaving off one panel and then hand stitching it in place. I am not sure of how well this will work out as we have not tried it ourselves. Do let us know how it turns out! I learned an easy way to make the round circles for the ends. Trace the size of the finished circle on a scrap of card stock. 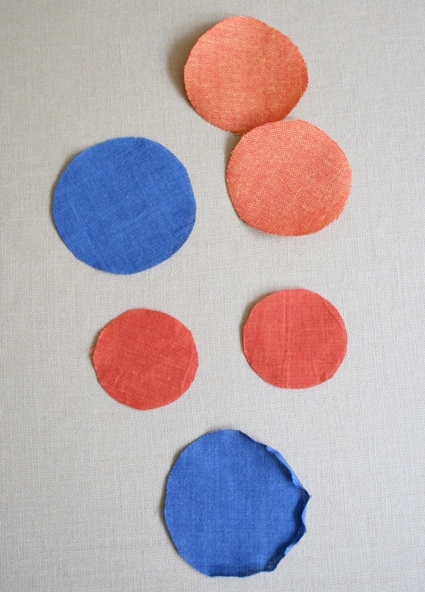 Cut a circle of fabric about 1/4 inch bigger than the paper circle. Using a running stitch, sew about 1/8 inch from the edge of the fabric. Put the paper circle in the center and use your running stitch to gather the fabric around it. Using an iron and lots of steam, press the fabric flat against the paper circle. 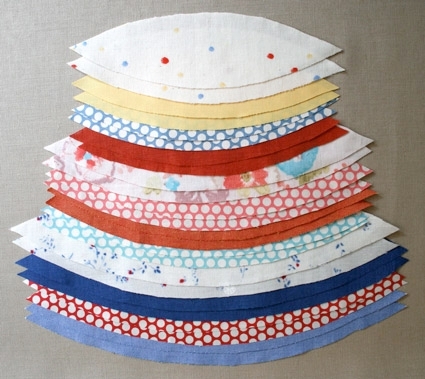 Pop out the card stock circle, and you will have a beautiful fabric circle with the edges pressed under smoothly. I like to edge stitch the circle on my machine before sewing it on by hand. How can I get the pattern of this ball? Thanks for writing in! The templates for these lovely balls can be found linked above in the The Pattern section just after the list of supplies! Thanks for writing in! 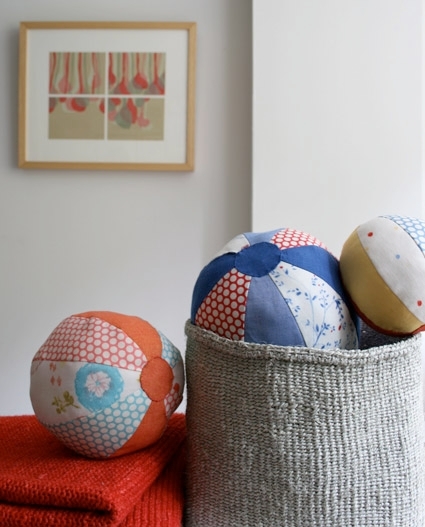 I think you might be interested in our Hand Sewn Puzzle Balls pattern or kit! You can purchase either a hardcopy or download only version of the pattern at this link.